With LTE for data, individuals looking to protect large areas like a property line can deploy security monitoring across a wider surface—assuming they're willing to foot the bill on data. Complimenting that added flexibility, it also includes a built-in rechargeable battery and weatherproof design, allowing short-term deployment for things like construction sites or seasonal use. And, of course, it has all the basics you'd expect in a security camera for 2018: 1080p resolution, 130-degree FoV, motion sensor, alerts, two-way audio, and microSD support for on-device recording. We're pretty familiar with Reolink's products here. Artem's a big fan of smart home gadgets, and he's played with a few of the company's other offerings. In general, he's been impressed by the company's hardware, though the software quality and integration aren't quite as good as some of the higher-end solutions. Even so, he's enjoyed using Reolink's Argus 2 with a solar panel. The Reolink Go is compatible in the US with AT&T and T-Mobile, and it's worth noting that you'll need to pay for cellular service for the camera separately. No data plan is provided. With other similar LTE-equipped offerings like the Arlo Go running $350-420, the cost of the Reolink Go is surprising. Early Bird pricing is $119 per camera ($159 after the first 100 sold, and ostensibly $250 at launch), while the solar-panel equipped model runs $176. The promo-price solar panel pack, at $136, has already sold out. 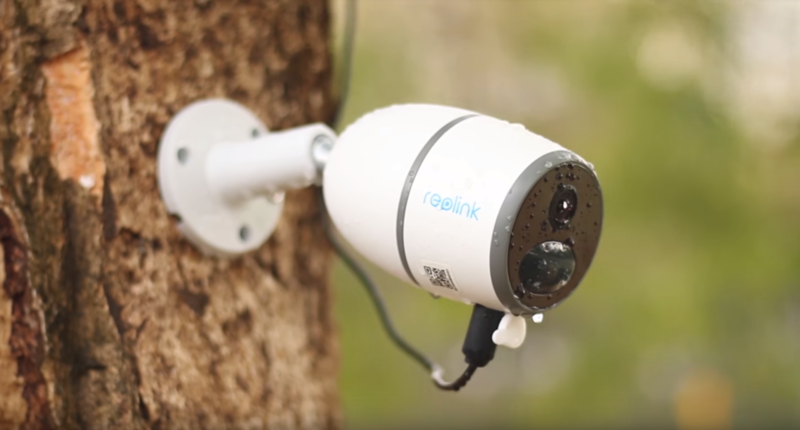 HONG KONG, April 24, 2018 (GLOBE NEWSWIRE) -- Reolink launches its first and groundbreaking 4G wire-free rechargeable security camera – Reolink Go on Indiegogo today after a stunning debut at CES 2018 back in January. While traditional video monitoring solutions still require WiFi/Ethernet connection or power outlets, Reolink Go is one step ahead. 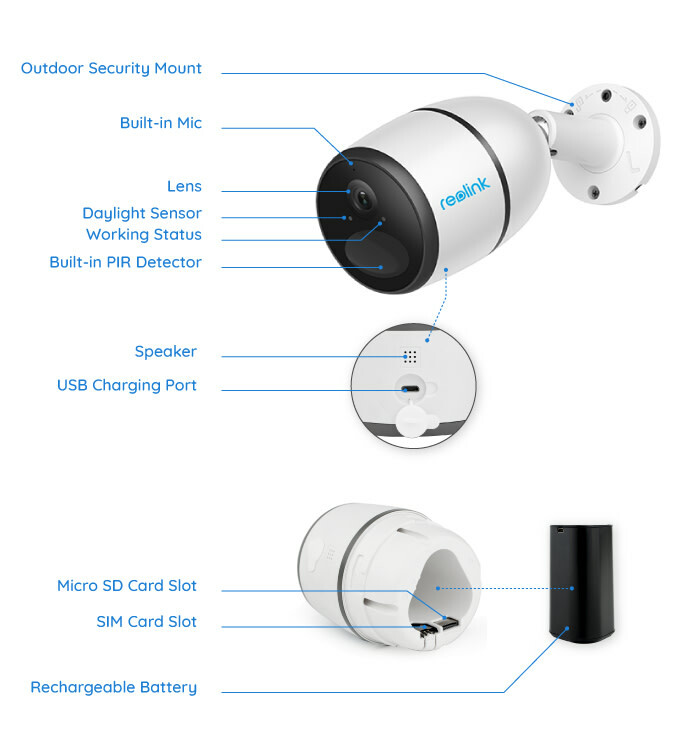 Connecting to the 4G-LTE mobile network and running on the rechargeable battery, Reolink Go, the 100% wire-free mobile smart camera, provides an easy video surveillance solution for places with no WiFi, no electrical power source, or any place that's previously unreachable for a WiFi-connected security camera! It connects to the 4G mobile network provided by various network service providers including the nationwide AT&T (U.S.), T-Mobile (U.S. & Germany), EE Limited (UK), Vodafone (UK, Germany & Italy), O2 (UK & Germany), Three UK, Wind Tre (Italy), and more. Wire-free Reolink Go also supports solar charging via the Reolink Solar Panel for constant solar charging. It can be set up in seconds and easily deployed and re-deployed with a simple tap on the intuitive mobile apps. 100% Wire-Free: Reolink Go is 100% wire-free portable security camera that allows users to place it anywhere. No wires, no hassle. 4G Connectivity: It connects to 4G LTE wireless network, enabling it to roam free in locations with limited or no WiFi. No WiFi, no worries. Rechargeable Battery: Long-running rechargeable battery extends battery life and cuts costs. Save troubles and save money. Solar Charging: It can connect to Reolink Solar Panel for constant solar charging and non-stop power supply. Flexible and eco-friendly. Starlight Night Vision: It captures better and sharper videos (up to 33ft) at night. More visual details and better clarity even in the dark. 1080p Full HD: It provides true 1080p (1920*1080) Full HD videos with 130° wide viewing angle. Smart Motion Sensing & Alerts: It detects motion smartly and sends alerts via notification & email in real-time; customizable voice alert is available. 2-Way Audio: The built-in speakers and microphone let users listen in and talk back interactively. Live View & Streaming on Apps: View live video feeds, record, snapshot, or just checking in with intuitive Smartphone apps (iOS & Android). Cloud Storage: Save motion-triggered recordings securely in the Reolink Cloud and never miss important details. Weatherproof Design: IP65 weatherproof Reolink Go braves elements, rain or shine, inside and out. Pre-order of Reolink Go (MSRP $250) is now available on Indiegogo starting from $119 USD (52% off) for the early birds on a first-come-first-serve basis. Early bird perks including $159 USD ($91 off) for one Reolink Go, $299 USD ($201 off) for Reolink Go 2-Pack and more special offers are available on Indiegogo. All items are estimated to be shipped in July 2018 to the United States, United Kingdom, Germany, and Italy. A cellular data plan is required for use and can be selected individually by consumers. More supported mobile network service providers in European countries will be updated later.